SUDEP is the sudden, unexpected death of someone with epilepsy, who was otherwise healthy. In SUDEP cases, no other cause of death is found when an autopsy is done. Each year, more than 1 out of 1,000 people with epilepsy die from SUDEP. If seizures are uncontrolled, the risk of SUDEP increases to more than 1 out of 150. These sudden deaths are rare in children, but are the leading cause of death in young adults with uncontrolled seizures. When people with epilepsy and their caregivers are empowered with information to understand SUDEP, they can take action to reduce risk of harm. 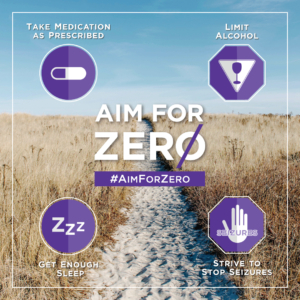 To respond to this urgency, raise awareness, and promote steps that can help prevent SUDEP, the Epilepsy Foundation’s SUDEP Institute has issued this Epilepsy.com Special Report and launched a dedicated #AimForZero hashtag to facilitate greater discussion of SUDEP. No one knows what causes SUDEP, but many areas are being looked at. SUDEP occurs most often at night or during sleep and the death is not witnessed, leaving many questions unanswered. There may be evidence that a person had a seizure before dying, but this isn’t always the case. Current research into the possible causes of SUDEP focuses on problems with breathing, heart rhythm and brain function that occur with a seizure. Breathing: A seizure typically may cause a person to briefly stop breathing (apnea). If these breathing pauses last too long, they can reduce the amount of oxygen that gets to the heart and the brain. A lack of oxygen can be life threatening if not treated immediately. Also, a person’s airway may sometimes get blocked blocked during a convulsive seizure, leading to suffocation (inability to breathe). Heart Rhythm: Rarely, a seizure may cause a dangerous heart rhythm or cardiac arrest. Brain Function: Seizures may suppress or interfere with the function of vital areas in the brainstem. These areas are responsible for breathing and heart rate as well as other important body functions. As a result, changes in brain function could cause dangerous breathing and heart rate changes. Others: SUDEP may result from more than one cause, or from a combination of breathing difficulty, abnormal heart rhythm and changes in brain function. Or, it may result from factors researchers have yet to discover. For a more details, visit the “How SUDEP Occurs” section. The best way to prevent SUDEP is to have as few seizures as possible. Taking medication regularly and at the right dose. Visiting your health care team regularly, especially if seizures are not controlled. If medicines do not work, consider other treatment options such as epilepsy surgery, devices, or dietary therapy. Take good care of yourself or your loved one. Eat well, get enough rest and regular exercise, avoid drinking too much alcohol or using recreational drugs, and minimize stress when possible. Be aware of and avoid any potential seizure triggers whenever possible. Keep a record of things that occurred before a seizure (such as illness, tiredness, stress, missing medications, and where and when the seizure occurred). Talk to your doctor about having your heart checked (cardiac evaluation) to rule out any heart problems. This is particularly important for people with uncontrolled epilepsy who don’t have a cause for their epilepsy found on an MRI or other type of imaging study. Be seizure safe. Make sure family and co-workers know what to do for seizure first-aid, take extra precautions around water, including swimming and bathing. Learn more about preventing SUDEP. Should I talk to my doctor about SUDEP? Yes! If your doctor has not spoken to you about the health risks associated with epilepsy, you should ask him or her about SUDEP. What risks do I or my family member have for SUDEP? What can we do to lessen the risk of SUDEP?